Location: Sarek National Park, Northern Sweden. How to get there: Locate the Swedish town of Gällivare. From here go about 45 kilometer east (along the Hwy. that subsequently serves Jokkmokk before heading south to Luleå) and locate the side road with signs for "Stora Sjöfallet." This road is a bit more than 90 kilometer. Locate the small place called Vietas and continue about 6 more kilometer. You should see a large dam ahead, note that the small side road that crosses to the opposite side of the river (left) turns off just before you reach the dam. Drive across to the island Jiertásuoloj and then further to the west side of the valley. Find parking here near an informational sign for mountain hikers/walkers. This location is close to N67:30.500, E018:10.170, elevation 420 meter. From the trailhead to upper Guhkesvágge: From the trailhead, locate a clear trail that heads uphill, away from the water. This trail starts among some rather messy structure of reindeer fences, obviously sometimes used to collect/sort reindeer. This trail does not run along the shore, it starts a bit higher up where the area on which one can drive has a small fork. This trail will cross a few of the reindeer fences, then run nicely through the fairly dense birch forest and cross the creek on a bridge. Continue this trail as it climbs the slope west of the mountain Hállji (1354m). If skiing, then look for skiable terrain above you, but be aware that there are a couple of avalanches that go west from the higher, steeper west slopes of Hállji. The route turns west and reaches the two small lakes marked at 945 meter, south of Hállji. Continue west on nice, level terrain just north of point 1016, then south of lake Vuosskeljávrre (930m), after a slight descent. 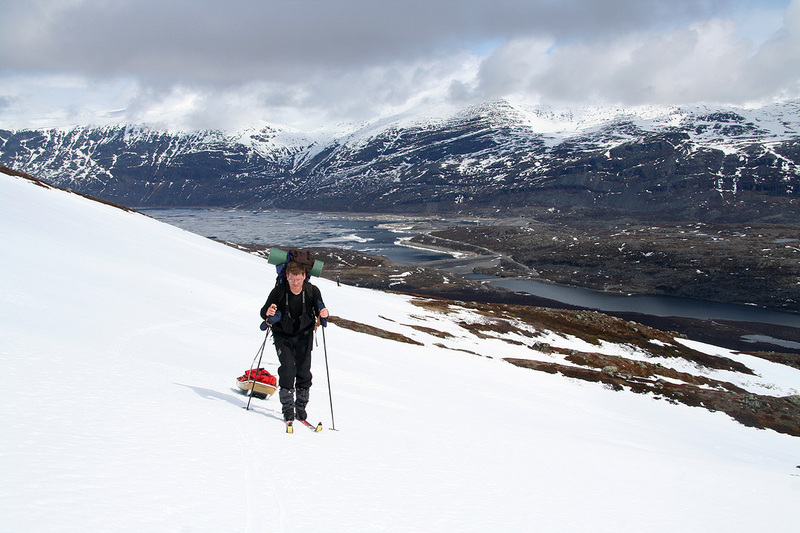 Continue on an ascending traverse north of Skálariehppe (1408m) as you contour west towards lake 1074. Ascend between Tjievratjåhkkå (1423m, south) and Tjårok (1215m, north), then continue your climb west as you aim for the shallow saddle north of point 1274, south of Tjievravárásj (1246m). This is the highest point of this section of the route. You can now, for the first time look into Sarek. The upper part of the valley Guhkesvágge lies down below. The sharp and impressive peaks in central Sarek are located on the opposite side. Contine the long and gentle descent towards the southern end of lake Oarjep Tjievrajávrre at 879 meter. The Garmin map indicates that there should be a hut ("Tjeurastugan") south of this lake, but that is an error. 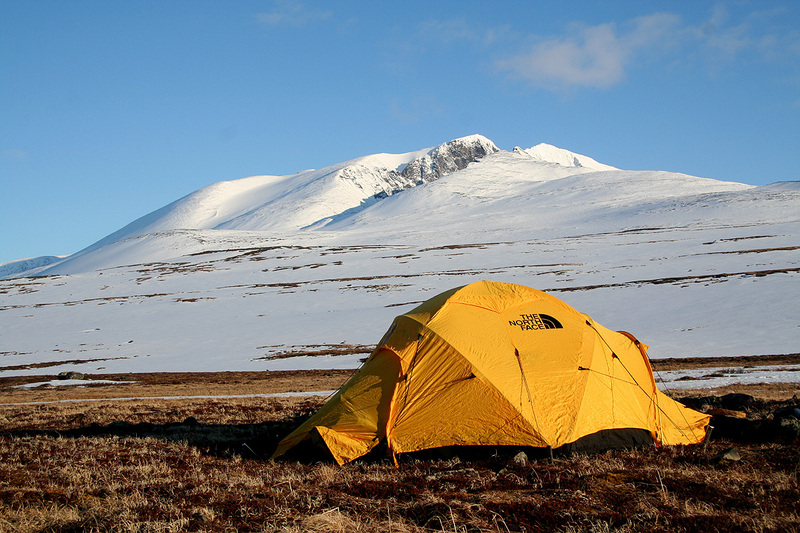 This general area is a good location for a "Base Camp", since the peak (as well as several others) may be climbed in a single day from here. From Base Camp to the summit: From the BC area, you may walk (or ski) up the gently rising slope towards the glacier Alep Sarekjiegna. First south-west, later more south. A suitable waypoint just before the glacier is located at N67:27.657, E017:42.521, with an approximate elevation of 1310 meter. The glacier is almost flat and should pose few, if any problems. In late May, the conditions for skiing were close to perfect. 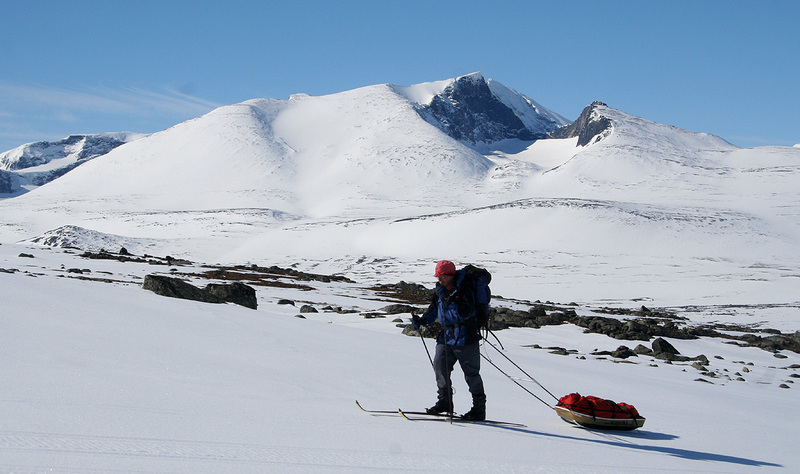 Head up the gently sloping glacier and aim for the corner (left side) where the long (east) ridge from "Stortoppen" (Main peak) of Sarektjåkkå meets the saddle. This is also the end of Alep Sarekjiegna, the glacier, Mihkájiegna, from the (south) west side is somewhat steeper as it slopes up to the same saddle. This point has coordinates N67:25.881, E017:41.965, with an elevation of about 1618 meter. When skiing, this is the place to leave the skis and proceed on foot. The north side of this lower part of the east ridge is not very steep. Ascend directly up this face, aiming for a pretty distinct gully that appears to connect nicely with the top of the ridge higher up. There are alternatives where you may connect with the top ridge somewhat lower down. Proceed up along the top of the ridge. Quite near where the aforementioned gully connects, there is a rock step on the ridge that can be easily turned on the left (north) side. From here, one can climb the peak while staying near the top ridge all the way. There is one slightly steeper section (see picture below), however, the route works out nicely. The summit point is relatively small and quite distinct (possibly this is just a buried cairn?). Also, see the very nice description of this trip on Geir Åke's webpage. Comments: This peak is the most remotely located Ultra prominent mountain in Scandinavia. I have walked by it (in the Rapa valley), in August 1973, however the weather was not good and a possible ascent had to be postponed. Just 34 years had elapsed and finally I had a firm plan to attempt the peak. I made this trip with Geir Åke Dahlen and Edward Earl (from California). 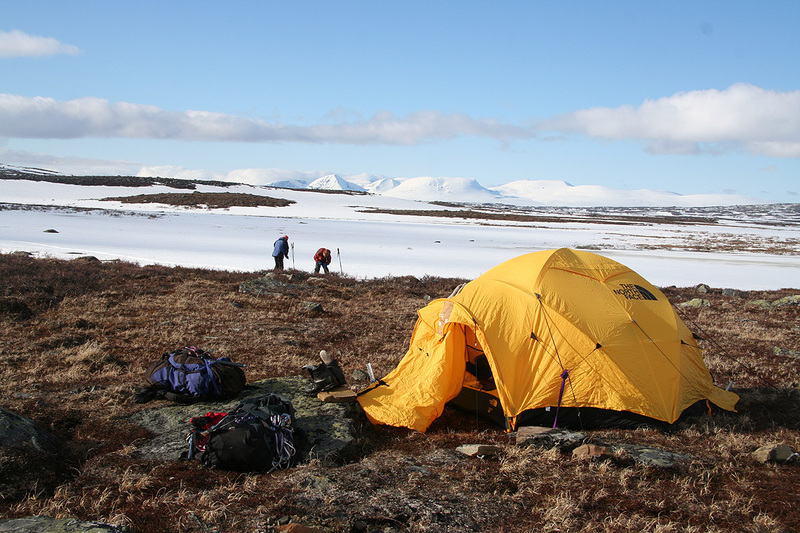 We drove from Tromsø before noon on May 26th, spent three nights in our tent, before returning to Gällivare on May 29th. The peak was climbed according to plan on May 28. A more extensive trip report with many photos is available. After dinner and good night sleep at the hotel in Gällivare, we headed back north in order to make a fresh attempt on Store Lenangstinden. 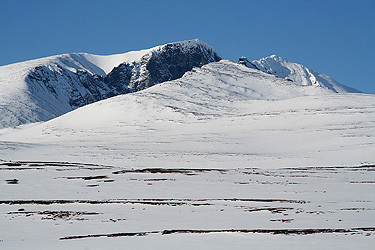 Sarektjåkkå, the top above the rock is the north summit while the highest point, Stortoppen, is the white summit further back. Early on day 2, the trailhead is near the dam in the background. Base Camp in Guhkesvágge, we stayed here two nights. The view is north-west towards Akka. Edward on a crux part of the ridge. Note our footsteps below this section in the far right. Finally, note the view west in the far left where Edward has completed the step. 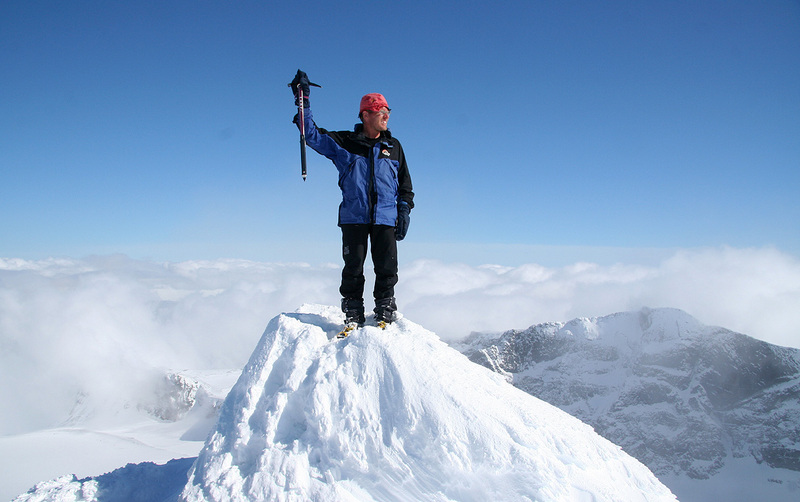 Geir Åke Dahlen, on the summit. BC Panorama I, the view is west. BC Panorama II, the view is north-west towards Akka. BC Panorama III, the view is east. We skied across the saddle in the middle of the picture. Skiing back out, Åke with Sarektjåkkå, across the valley.